Today is Leonard Bernstein‘s 100th birthday. Bernstein is one of my favorite composers so I have really enjoyed the attention to his music during his centennial. In the past year I’ve heard two performances of Candide in San Francisco and Santa Fe, my first-ever experience of Trouble in Tahiti at Opera Parallèle, and a splendid version of Arias and Barcarolles which has just been released as a digital recording from the San Francisco Symphony. 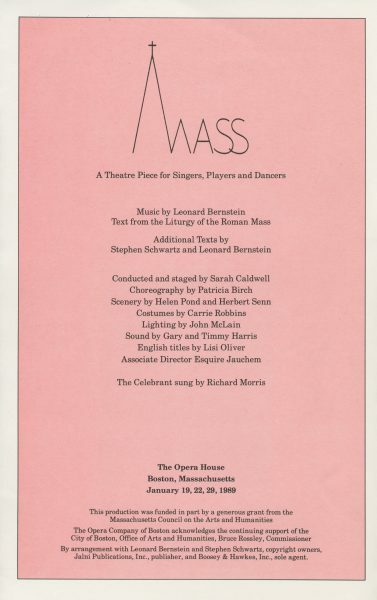 My favorite work of Bernstein’s – yes, even more so than West Side Story – is his Mass: A Theatre Piece for Singers, Players, and Dancers. Seeing the recent commentary about Mass and other Bernstein compositions during the centennial struck me as very interesting. It has been a great way to see what writers share my sense of what is important in art and music, and which writers have a perspective totally opposite to that. I had a somewhat unusual introduction to this piece. Gordon Hallberg, the director of the MIT Brass Ensemble when I was a graduate student, made a brass ensemble arrangement of excerpts from the piece that we performed at a concert. Hearing the music divorced from the words and staging, I wondered what was this beautiful music and why hadn’t I heard it before? I eventually heard the original cast recording but it didn’t move me as much as I had hoped. Things changed when I got to see two performances in the course of six months. 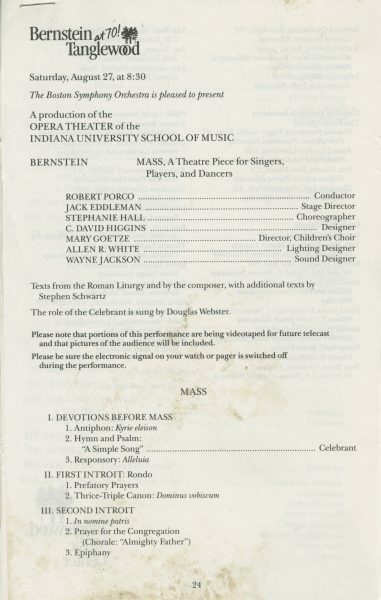 The first was the Indiana University Opera Theater performance with Douglas Webster as the Celebrant, done at Tanglewood in August 1988 as part of the Bernstein at 70 celebration. 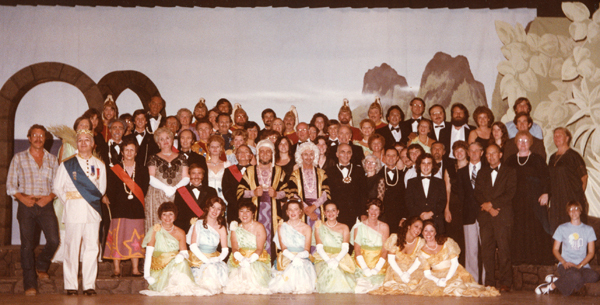 The second was Sarah Caldwell’s fully staged production at the Opera Company of Boston in January 1989, with Richard Morris as the Celebrant. After seeing those two performances I was absolutely and completely hooked on this marvelous work. 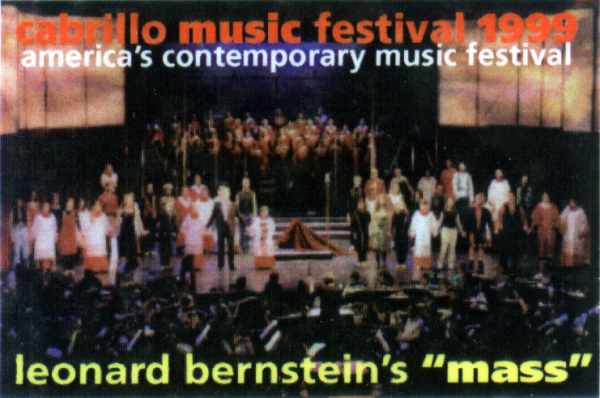 When I saw the article in the San Jose Mercury News that the Cabrillo Festival of Contemporary Music was doing Mass in August 1999 and auditioning for a chorus – the day before I left for a business trip – I made sure to call them from the road so I had an audition waiting when I got back. I got the gig and sang in the Choir for 3 performances conducted by Marin Alsop, The production was directed by Douglas Webster who again played the Celebrant. The Street Chorus was packed with amazing local singers, including Lori “Bob” Rivera (singing World Without End) and William Neely (singing Easy). I purchased the vocal score to Mass in advance of our rehearsals and it remains one of my most cherished scores, even though the Celebrant is a baritone role and I’m a tenor. So why do I love the Mass so much? Let me count three main ways. If there’s a type of Western music that you could write in 1970, it’s probably in Mass. You have traditional classical / opera / musical theater writing, electronic music broadcast over a quadrophonic system, pop music, rock music, gospel, blues, jazz, marching bands, and twelve-tone music all side by side. All are filtered through Bernstein’s sensibilities. Some perceive this as watered-down or pallid. I see it as a brilliant composer integrating as many different sources as possible into the ultimate statement of breaking down musical barriers between high and low, classical and pop. This is far from the only Bernstein piece to do this, but nothing I know of takes it out there as far as Mass. This was not a popular thing to do in 1971. Classical music in academia was still largely beholden to serialism and not friendly to tonality. Rock music was still viewed at odds with classical music, a year or two before the progressive classically influenced bands became really popular. Producing this type of work for such a high profile commission was an act of artistic bravery. The questioning, Jewish spirit behind the Mass is especially seen in the additional texts by Stephen Schwartz and Leonard Bernstein. Some of the more overt Jewish-ness comes out in a joke about the Trinity, a sceptical take on confession, or changing into Hebrew for the Kaddish. For me, the ever-increasing challenging of the Celebrant by the Street Chorus seems to come straight out of the ever-questioning, interpretive spirit of Judaism. It naturally also reflects the confusion and searching of a tumultuous time in United States history, with a country intensely divided over the war in Vietnam and hippie youth culture. To do whatever we please. Lord, we’ll have to set this one on fire. 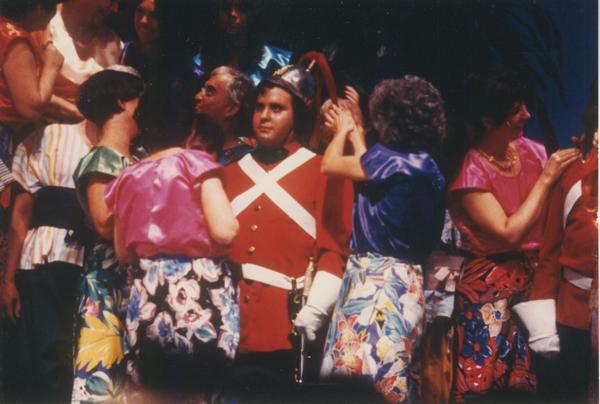 In our Cabrillo production, Douglas Webster had several members of the Choir join in this confrontation by stepping out of the choir at the back of the stage and joining in the gyrations of the Street Chorus on the main stage. I was one of those Choir members and it was an incredibly intense experience. We then had to freeze for 13 minutes while the Celebrant goes through his “Things Get Broken” mad scene, until the Communion finale which offers some hope – maybe – of reconciliation. The way that the music and lyrical messages reinforce each other would take something much longer than a blog post to illustrate. Bernstein does this in a theatrical context and you really do need to do this as a theatre piece to pull it off completely. A stand-up-and-sing concert version just isn’t going to make the full impact. Neither will a recording, but for most people that is the best opportunity available to experience this music. I think Marin Alsop’s recording with Jubilant Sykes and the Baltimore Symphony Orchestra is the finest I have heard. I’ve had the great privilege of having sung Bernstein’s vocal music with two of the conductors most associated with Bernstein and today: with Marin Alsop for Mass and Michael Tilson Thomas for Chichester Psalms. I am filled with gratitude for being in the right place at the right time to have that happen. Thank you so much, Leonard Bernstein, for all you have given us. Your compositions, your recordings, your videos, lectures, and books, and your progeny both biological and cultural have all enriched us in immeasurable ways over the years. I am confident they will continue to do so for long into the future. Although I haven’t been posting here lately, 2017 has been a busy year for music – both as a performer and audience member. Here are some of my musical highlights from the past year as we head into 2018. My first performances of 2017 were in West Bay Opera‘s production of Puccini’s Il trittico. The men’s chorus sings offstage at the start of Il tabarro and at the end of Suor Angelica, and not at all in Gianni Schicchi. Even though we had very little music to sing, it was fantastic to be part of this production and learn how these operas work. 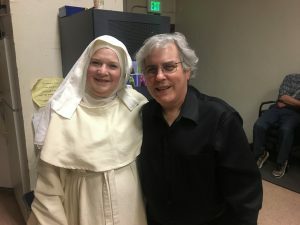 Here I am backstage with my wife JoAnn Close who sang Lay Sister 2 as part of the Suor Angelica chorus. 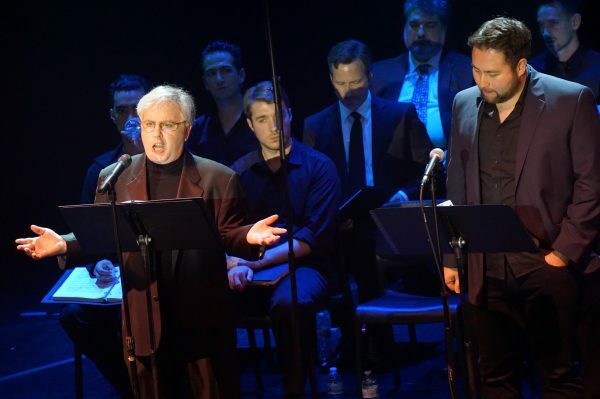 February also marked the San Francisco premiere of John Adams’ The Gospel According to the Other Mary, performed by the San Francisco Symphony and Chorus under the direction of Grant Gershon. Kelley O’Connor, Tamara Mumford, and Jay Hunter Morris headed a stellar cast in this provocative and moving work. 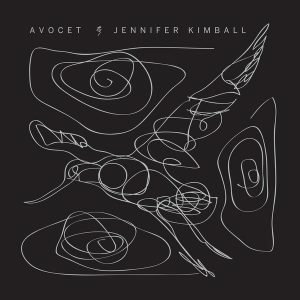 Jennifer Kimball released her fabulous album Avocet on March 3. Jennifer was one half of The Story, but in those days she sang without writing any of the songs. Avocet is her third full-length solo singer/songwriter album, her first in over 10 years, and probably her best yet. Will Layman’s Pop Matters review describes some of the background and musical choices that led to the fresh sound and performances. I finally got to hear U2 in concert! 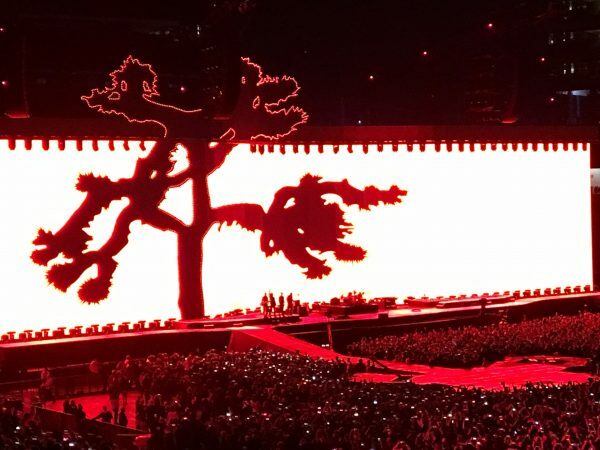 The 30th Anniversary tour for The Joshua Tree came to Levi’s Stadium in Santa Clara. It was everything that all my friends who had attended U2 concerts told me it would be; a real rock and roll revival meeting. Mumford & Sons opened, so I got to hear another of my favorite groups in concert for the first time. May also marked my debut with South Bay Musical Theatre in a concert production of Chess. The cast split up all the songs, with everyone singing chorus in songs where we were not soloists. Our performance was based on the licensed London version, but we secured the rights to interpolate some songs from the Broadway version. Those additions led to another debut for me – singing two solos in Hungarian! The photo above shows my other solo, singing some of Walter’s lines. Thanks to László Sigrai for helping me through the Hungarian diction while we were both attending Musikmesse, and to Walter Mayes, Asa Stern, and Anita Hsiung Carey for casting me in the show. 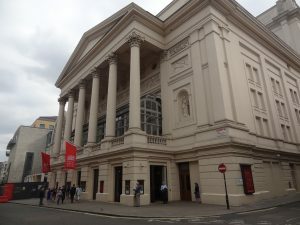 June saw us visit London where we saw several great performances: the Ensemble Intercontemporain at Wigmore Hall, L’elisir d’amore at the Royal Opera House, and The Book of Mormon at the Prince of Wales Theatre. L’elisir was the most memorable. I love this work, having been in a magical production at West Bay a few seasons ago. The continued popularity of this Royal Opera House production is no surprise as it is wonderfully well staged. Ivan Magri gave an especially courageous performance as Nemorino. He appeared to have lost a battle with a hay bale at the end of Act I and pull some muscles near his rib cage, yet he continued to sing and act beautifully throughout Act II. The other principals and chorus were alert to the staging changes needed to accommodate a Nemorino who couldn’t stand up for very long, or climb stairs up to a platform without a helping hand. July brought the San Francisco touring production of Hamilton. I was fortunate enough to see this on Broadway with the original cast. The San Francisco performance was just as great, with different voices and interpretations that brought out additional facets of the piece. 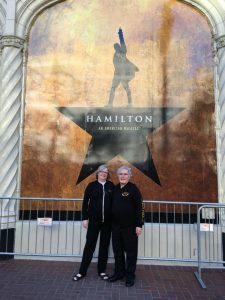 I don’t think I’ve raved about Hamilton on this blog, so let me do that now. This is one of the greatest pieces of theater – greatest works of art – that I have ever seen and heard. It is a spectacularly creative work, the first in a long time to incorporate contemporary popular music into a Broadway idiom in a show intended for all ages. Lin-Manuel Miranda brilliantly uses rap to serve the same function as recitative in opera and dialogue or melodrama in other musical theater work: as a way to communicate larger amounts of verbal information in a smaller amount of time than you can do with singing. The score is not just hip-hop music; it’s a brilliant combination of all sorts of R&B, Broadway, pop, and hip-hop styles. To do this in the service of a book that treats American history in a serious and highly entertaining way is simply stunning. Anyone who cares about opera or musical theater in any of its forms should see Hamilton. 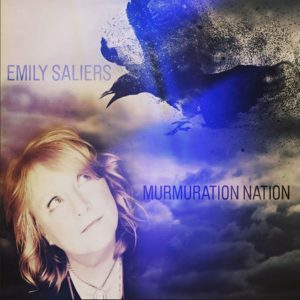 August marked the release of Emily Saliers‘ album Murmuration Nation. Of the new albums I’ve heard this year, this is the one that best captures American life in 2017, especially in songs like “Fly” and “OK Corral.” Some of the songs have a production similar to the Indigo Girls albums, especially in the latter half of the album, while others go in new and delightful directions. This is a wonderful debut for Ms. Saliers as a solo artist. August also took us to Santa Fe Opera for three productions: Rimsky-Korsakov’s The Golden Cockerel, Mason Bates’ The (R)evolution of Steve Jobs, and Handel’s Alcina. All three were excellent performances. 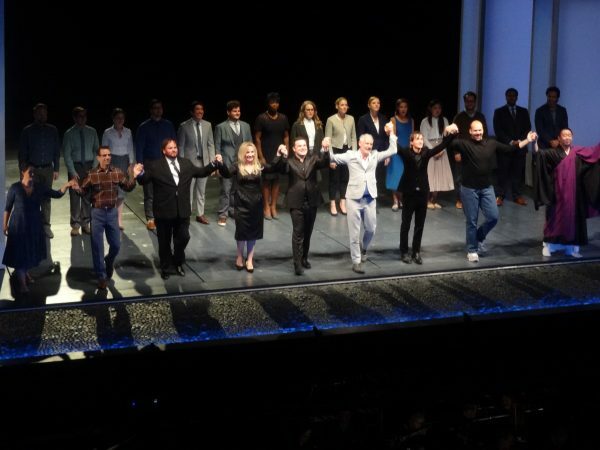 Alcina in particular was extraordinarily well-sung by a cast headed by Elza van den Heever in the title role. It was the premiere production of The (R)evolution of Steve Jobs that was the most newsworthy, of course. It was very well received – the photo above comes from the bows. While I also enjoyed it, it also felt like a terribly missed opportunity. I am a huge fan of Mason Bates’ music and he seemed like the ideal composer to tackle the subject matter. I enjoyed his music but found two main problems with the work – its length and libretto. The (R)evolution of Steve Jobs lasts only 90 minutes, which is an unfortunate length for an opera unless the composer’s name is Richard Strauss. It is too short for a full-length opera and too long to be paired with another one-act. Yes, it is difficult to imagine an opera like Salome being any longer or shorter than it is. This opera though seems rushed, and that contributes to the problems in the libretto. I think those could be resolved without a whole lot of extra length, keeping well within 2 hours. My main concern is the libretto by Mark Campbell. In The (R)evolution of Steve Jobs, the only reason to care about the title character is what we know from real life. Coming into the theater, we already know how Jobs changed our world: through a series of beautiful computing devices that have profoundly affected and enriched so many lives. None of this is shown in this opera. The closest we get is the iPhone product launch, but that scene’s celebratory nature is undercut in many ways. The chorus subverts the launch with critical questions (which is true to life – the iPhone initially had many naysayers). The graphics accompanying the scene are not real iPhone graphics, but something else much uglier than anything that Steve Jobs would have ever allowed on a stage in 2007. A little “wrong, all wrong” might have made this better. Later on, the Kobun character ridicules the product launches, even though they are Steve Jobs’ greatest works of performance art, and the way he introduced so many life-changing inventions to the world. The Steve Jobs shown in the opera is pretty much reduced to being a jerk. Everyone I know who worked for or with Steve Jobs confirms that he was extremely demanding and could indeed be a real jerk. But he was demanding in relentless pursuit of a humanistic vision of technology that transformed the world. When this opera shows Steve being demanding in the workplace, is it during development of the Mac? The iPod? iTunes? The iPhone? The iPad? Any of Steve Jobs’ great successes that changed our lives? No – it’s during development of the Lisa! The Lisa is interesting from a historical perspective (we had one for competitive evaluation at our DEC usability lab) but it was a commercial flop and never transformed the world. With so many hit products, why show the hero of the opera being a jerk in the pursuit of a failed product? Is the librettist scared to death of ever showing the title character in a favorable light? The reason is likely due to the plot line with Chrisann Brennan and his disowning their daughter Lisa. If the opera were longer than 90 minutes, perhaps both the technology and Lisa aspects could have been covered in separate scenes, rather than trying to have one scene do double duty and failing. With only 90 minutes available, the libretto discards the humanistic technology visionary and leaves us with the unlikeable jerk. Fortunately Mr. Campbell appears to have much more sympathy for Laurene Powell Jobs. She has beautiful words and music to sing and was given an absolute dream performance by Sasha Cooke. Laurene’s “Humans are messy” aria just ripped my heart out. Even with all the missed opportunity, this opera currently packs an emotional punch which resonates well with audiences. Soon afterwards we come to the gravely disappointing final scene. The opera ends with the character of Laurene hectoring the audience not to look at their phones “after this is over” but that “Version 2.0” of Steve Jobs would want you instead to “Look up, look out, look around”. This rings entirely false to both the real-life people and to the characters of Laurene and Steve created in the opera. The program book tells us this was based on a request from Charles MacKay, general director of Santa Fe Opera. Mr. MacKay has done a lot of great things at Santa Fe Opera, but sabotaging the finale of this opera will not be remembered as his finest hour. Mark Campbell’s cynicism about technology in general and Steve Jobs in particular is a real problem for the librettist of an opera about Steve Jobs. This isn’t just my perception. Mr. Campbell himself admits in the program notes that Mason Bates “often balanced my more cynical perception of the story with his more emotional view and urge me to find more humanity in the roles.” Unfortunately Mr. Bates’ entreaties do not seem to have succeeded, especially in conveying in words the emotion behind working in technology. My disappointment is so great because this opera seems so antithetical to what Mason Bates has composed in the past. Mr. Bates has been our leading composer of how technology affects us as people, a deeply important topic for artists and composers to address in the early 21st century. Sometimes he emphasizes the positive, as in Mass Transmission. Sometimes he portrays both the good and the bad, as in Alternative Energy. What a shock to see him composing an opera to a libretto that so completely misses the mark as to the human value of the technology being created, and of the person who guided it to fruition in an unprecedented series of technological, commercial, and cultural successes. In December I found that I really enjoyed Girls of the Golden West while many critics disliked it. I am trying not to fall into the trap of critiquing the opera the creators chose to write, versus how the opera succeeds or fails on its own terms. Mr. Campbell says he was trying to “neither deify nor demonize Steve Jobs.” So I think it’s fair to point out that I believe he missed the mark in that regard. The opera is not full-on demonization, but it comes pretty close. Opera is a deeply collaborative art. I dearly hope that Mason Bates will write more operas in the future, but that he will take more care in his choice of collaborators, especially librettists. Don’t choose a librettist who is cynical about the subject of your story. Stand up to meddling general directors when a well-meaning suggestion will sabotage your work. Opera is hard enough when everyone is fully invested in the story; it is far harder when your collaborators are subverting it. I have heard that Mr. Bates is revising the opera in preparation for later performance in San Francisco and elsewhere. I hope that libretto changes are part of this process. If I did not love Mason Bates’ music so much, it would not be worth the effort to critique the opera in its current state. I am looking forward to the upcoming recording so that I can get more familiar with the many delights in his wonderful score. 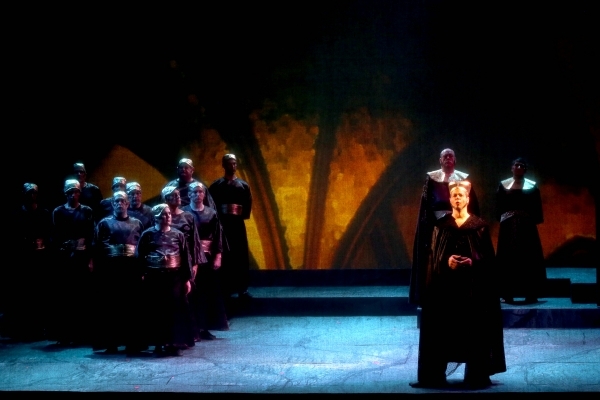 West Bay Opera performed Norma in October to start the company’s 62nd season. After a season of operas with minimal or no chorus, this season’s operas all feature the chorus prominently. Somehow I had never seen or heard Norma before. So it was a great delight to both sing and learn this opera, directed by Igor Vieira and conducted by José Luis Moscovich. Christina Major sang the title role superbly, including wondrous duets with Veronica Jensen’s Adalgisa. I have sung in many fine choruses at West Bay Opera over the years, but the Norma chorus was probably the best one yet for overall consistency across all singers and sections. 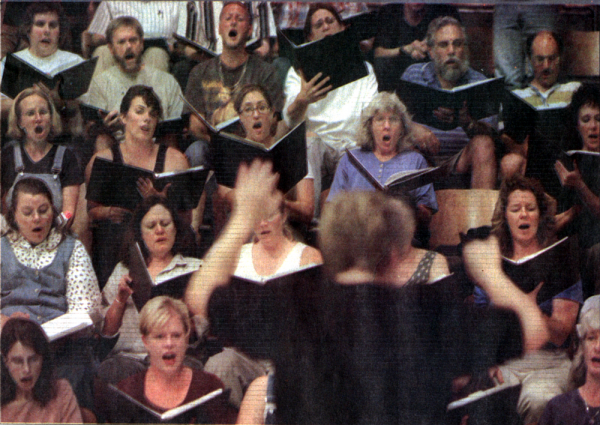 It was noticed in John Orr’s review for the Bay Area News Group: “The chorus is powerful and beautiful, creating a tsunami of gorgeous sound that burst out over the audience at the Lucie Stern Theatre.” Thanks to Bruce Olstad for his fine direction of the Norma chorus, and all his work in directing and developing the West Bay Opera chorus over the years. November included a trip to New Orleans for a reunion of first cousins on my Mom’s side of the family. The buskers around the city were all wonderful performers, with the most consistent excellence I can recall hearing in any city. We were fortunate enough to hear the Ellis Marsalis Quintet perform at Snug Harbor with an amazing lineup: Nicholas Payton on trumpet, Adonis Rose on drums, Derek Douget on Sax, and Jason Stewart on bass. November also marked the premiere of John Adams’ latest opera Girls of the Golden West at San Francisco Opera. This remarkable opera is the latest of the collaborations between composer John Adams and librettist/director Peter Sellars. Grant Gershon was back in San Francisco to conduct. 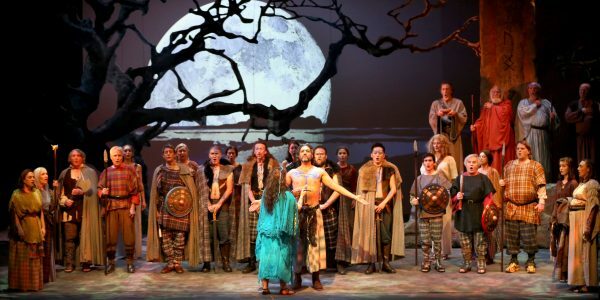 We have been watching Peter Sellars productions since his 1981 production of Handel’s Orlando at the American Repertory Theatre in Cambridge, Massachusetts. He has directed many of my most profound opera and musical theater audience experiences. We’ve also seen many of John Adams operas and I’ve sung his oratorio El Niño in a semi-staged performance. I haven’t enjoyed everything from these two brilliant artists, but the hits have far outweighed the misses. So I am always ready for something new when these two are involved. Girls of the Golden West is in two acts. The first act shows the coming together of a California gold rush community in 1851. The second act shows that community coming apart. To me, the opera came across as a cri de coeur for building a better community in our state, our nation, and the world. I had a mixed reaction to Peter Sellars’ collage-style libretto in Doctor Atomic. On first hearing I felt the first act worked much better than the second act. In contrast, I found the Girls of the Golden West libretto effective throughout. I loved Dame Shirley’s language for the singers. It conveys such specific time, place, and individual personality, and therefore sounds like no other libretto I have ever heard or expect to ever hear again. As with most new operas and other long-form works, I feel it will take repeated hearings to get the most out of the music. On first hearing the music seemed comparable in style and quality to other Adams operas. It seems a step back in musical complexity from some of the more recent orchestral pieces. That strikes me as a good thing for this visually, linguistically, and thematically complex language. The opera received very mixed reviews in this premiere production, but even the reviews critical of the opera were full of praise for the singers. Julia Bullock was especially fabulous heading the cast as Dame Shirley, but there were no weak links anywhere. The interactions between Julia Bullock’s Dame Shirley and Ryan McKinny’s Clarence make me eagerly anticipate their upcoming appearance as Kitty and J. Robert Oppenheimer in next year’s Santa Fe Opera production of Doctor Atomic. Many of the negative reviews seem to criticize the type of opera being written rather than trying to meet the opera on its own terms. Joshua Kosman for instance thinks that “this collage technique fails to produce a workable dramatic framework.” Mr. Sellars has forgotten more about theater than Mr. Kosman or I will ever know, and he is clearly not looking for a traditional dramatic framework here. I think it succeeds admirably in conveying great feeling with fine accumulation of detail, but I can see how others will disagree. My receptiveness to Sellars’ vision in this opera probably due in part to being in tune with so much of his theatrical vision in other operas over the past 36 years. January 6 marks the start of our chorus rehearsals for Fidelio at West Bay Opera, directed by Ragnar Conde and conducted by José Luis Moscovich. Performances are February 16, 18, 24, and 25 at the Lucie Stern Theatre in Palo Alto. The 62nd season will conclude with Carmen in May 2018. As an audience member, I am particularly looking forward to Candide at San Francisco Symphony, the Ring cycle at San Francisco Opera, and Doctor Atomic and Candide at Santa Fe Opera. Have a happy, musical 2018! Chess photo by Barbara Heninger. Norma photo by Otak Jump. So how have things worked out since then? We have made great progress, and there is still much more work ahead of us. The initial project that started the Recordare acquisition discussions was modernizing Finale’s file format to be forward and backward compatible. Five years ago, a file created in a later version of Finale could not be opened by an older version of Finale. This also meant that SmartMusic accompaniment files created in a newer version of Finale could not be used in older versions of SmartMusic. This led to long periods where our customers could not use the latest version of Finale to create SmartMusic SMP files for the latest version of SmartMusic. After two years of work, we delivered the new Finale .musx file format in November 2013 with Finale 2014. In July 2014, we updated our SmartMusic desktop and iOS applications to accept the new .smpx file format for SmartMusic accompaniments. The true test of the file format came this past August when we released a new Finale v25 update. People were able to open files created in Finale v25 in Finale 2014. There was no interruption in being able to create SmartMusic accompaniments for the existing SmartMusic desktop and iOS applications from Finale v25 – things just worked. While the file format project was the short-term goal for the acquisition, the strategic goal was longer range. MakeMusic realized that at some point it would likely need to modernize the SmartMusic application to better serve the needs of music practice. The modernized product would need to be able to use new web and mobile technologies, and most likely include a new music file format. To make that work, MakeMusic would need to be able to convert its existing SmartMusic subscription repertoire from the current Finale-based file format to whatever the new file format might be. MusicXML would be the way to do that. The Recordare asset acquisition would give MakeMusic full control over the MusicXML export from Finale as well as the MusicXML import into a new SmartMusic format. This is exactly what happened with the launch of the new web-based SmartMusic earlier this year. In July 2015, MakeMusic acquired Weezic, establishing MakeMusic SAS in Paris. The Paris team worked together with Arpege Music to launch the new SmartMusic, running on Chromebooks and other web-based platforms. For most of the past year I have worked on improving the MusicXML export out of Finale to get the best possible repertoire conversion from desktop SmartMusic to the web-based SmartMusic. We also added one-step export of MusicXML files from all linked parts in a Finale file to ease the import of Finale-created MusicXML files into the new SmartMusic. Creating the best possible music practice app in SmartMusic is a key part of the digital sheet music future. MusicXML has turned out to be a key part of this process, just as we anticipated five years ago. The MusicXML format itself also received improved support with the greater resources of MakeMusic. We created a new MusicXML web site with easier-to-use MusicXML documentation, converted the old MusicXML mailing list to a forum, and held several successful meetings at the Musikmesse and NAMM trade shows. However, the acquisition changed important dynamics within the MusicXML community. Many companies that had collaborated with Recordare became hesitant to collaborate with MakeMusic. Recordare was not a competitor, but MakeMusic was. Joe Berkovitz from Noteflight recommended for many years that MusicXML move to a community group in the World Wide Web Consortium. MakeMusic management saw the advantages of this move, and Steinberg agreed to simultaneously transfer their Standard Music Font Layout (SMuFL). In July 2015 we started the W3C Music Notation Community Group. The group is currently working on new MusicXML 3.1 and SMuFL 1.2 updates, and is also investigating a more long-ranging update to web-based music notation standards. When I agreed to sell Recordare assets to MakeMusic, it was no secret that it could be an adventurous ride in the future. MakeMusic had been through numerous CEOs in the past several years, and was not showing the growth that public company shareholders wanted to see. In 2013, MakeMusic was acquired and taken private by its largest shareholder, LaunchEquity. A year later, MakeMusic joined Peaksware and the company moved from Eden Prairie, Minnesota to Boulder, Colorado. A great core of people made the move from Minnesota to Colorado, bringing important continuity, but more people needed to be hired once the move was made to bring the teams back to full strength. Throughout these moves I remained here in Silicon Valley with periodic trips to MakeMusic headquarters. My role within MakeMusic evolved throughout these organizational changes, and I have been serving as Vice President of MusicXML Technologies since last April. In April we also announced that the educational music publisher Alfred Music would also join Peaksware. MakeMusic and Alfred operate independently, and SmartMusic continues to support and promote repertoire from all interested publishers. However, having MakeMusic and Alfred under one corporate umbrella offers tremendous possibilities for the digital sheet music future. It brings Peaksware ever closer to the vision that I had for Recordare when I started the company nearly 17 years ago. My next performances will be very special events. 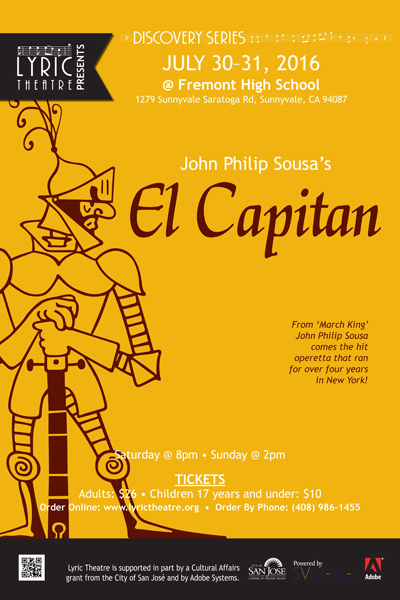 Lyric Theatre of San José is presenting the first performances of John Philip Sousa’s El Capitan in California since the original production’s nationwide tour 120 years ago. I will be playing the role of Señor Amabile Pozzo, Chamberlain of Peru. This semi-staged concert production is directed by Paul Zawilski and conducted by Jeff Yaeger, with vocal direction by Neil Midkiff. Performances will be on Saturday, July 30 at 8:00 pm and Sunday, July 31 at 2:00 pm at Fremont High School’s Shannon Theatre in Sunnyvale, California. Tickets are only $26 for adults, $10 for children, and available online or by phone. Wait a minute, you say. Wasn’t Sousa just a composer of marches? Really good marches, yes, but can an expert at 3-minute marches who railed against padding of musical material actually compose a really good 2-hour operetta? And are the tunes in the El Capitan march actually in the operetta? The answer is yes, Sousa could compose a really good operetta. This was by far his biggest stage hit, running for 4 years in a row in New York and on national tours. The famous El Capitan march contains some of the best tunes from the show, of course, but there’s lots more top-notch music where that came from. What about the book, you ask? Some of these late 19th-century shows have very musty books full of topical references that you need a bunch of footnotes to understand. Or they have a very sentimental quality that isn’t in tune with contemporary tastes. Or both. I actually had no idea how good a show El Capitan was when I agreed to do it. I just knew it was a rare chance to perform a Sousa show, and given how much Sousa was a part of my youth as a band kid it was an opportunity I couldn’t refuse. I was delighted to see how contemporary and funny the show actually is. The basic plot is that Don Errico Medigua, career politician, has been appointed to be the new Viceroy of Peru by King Philip of Spain. However, this new appointment means that the prior Viceroy, Don Luiz Cazarro, is being pushed out of office prematurely. Cazarro is understandably unhappy about this and leads an insurrection to force Don Medigua out of office. He has hired the noted mercenary El Capitan to lead his forces. Don Medigua is well aware of this when he ships off to Peru. When he finds that El Capitan died in a brawl on the same ship, he decides to assume El Capitan’s identity and become an insurgent against himself. In the meantime he manipulates El Capitan’s reputation in Peru into something enormous. Medigua figures that if the requested Spanish reinforcements arrive in time, he will return as Viceroy. If they don’t, and the insurgents win, he will be on the right side there as well. Of course once he assumes the role of El Capitan, some people figure out pretty quickly that he’s more of a politician than a warrior. So yes, politicians were manipulating the media for their own ends way before contemporary times and movies like Wag the Dog. It is a very silly and funny plot setup that leads to a lot of comedy. This is a show that lives and dies on who is cast as Don Medigua / El Capitan. You need an excellent, charismatic comic actor who is also a fine singer. We are fortunate to have Google’s own Dan Galpin as the star of our show. I enjoyed performing with Dan in Lyric Theatre’s Utopia, Limited, but El Capitan is a far greater showcase for his prodigious talents. My role is Pozzo, Don Medigua’s loyal chamberlain. Pozzo is a comic tenor, and the first role I’ve had that combines dialog and solo singing – in this case, much more dialog than singing. It was created in New York by another short actor, Alfred Klein, brother of Charles Klein who wrote the El Capitan book. I am grateful to Paul, Jeff, and Neil for giving me this opportunity. Pozzo has some very funny lines which I hope the audience will enjoy as much as the cast has in rehearsals. So don’t miss your chance to see and hear a whole different side of John Philip Sousa! We will have a full orchestra, a cast full of experienced and delightful Lyric Theatre performers, and fine artistic leadership. The last weekend in July will be Sousa time in Sunnyvale. In times like these we need comic opera more than ever. Saturday night was another example of the great golden age we are enjoying in San Francisco with Michael Tilson Thomas and the San Francisco Symphony. For this one night only, there was an amazing all John Cage concert that was absolutely stunning. The concert started with Cage’s early ballet The Seasons from 1947. This is a very pleasant piece, completely notated without chance procedures. But if this were the summit of Cage’s invention, he wouldn’t be remembered like he is today. MTT introduced it with an apt analogy – listening to The Seasons is like going to an art museum and seeing the early, more realistic, less abstract paintings by artists like Kandinsky and Mondrian. After intermission came the main event: Cage’s Renga from 1976. In this piece the musicians are invited to interpret snippets of Henry David Thoreau line drawings musically, using whatever means they like, according to predetermined register, dynamics, and timeline. What comes from this tends to be what MTT described as a “rainforest” of sound. And a last-minute addition, Haiku, performed by Michael Tilson Thomas on piano from a manuscript left to him by Lou Harrison. The contrasts and overlaps between these sources and the delightful musical and sonic material of both the parts and whole made for an exquisite performance. I couldn’t really distinguish the ensemble pieces so much from the overall Renga since the performers were seated together with the rest of the orchestra. The other soloists were distributed around the periphery of the orchestra and in the tier above the stage where the chorus sings, providing better spatial separation for both ear and eye. Screens above either side of the stage showed different videos. It was quite the musicircus indeed! I have nothing to say and I am saying it and that is poetry as I need it. Noises, too, had been discriminated against; and being American, having been trained to be sentimental, I fought for noises. Slowly, as the talk goes on, slowly, we have the feeling we are getting nowhere. That is a pleasure which will continue. If we are irritated it is not a pleasure. Nothing is not a pleasure if one is irritated, but suddenly it is a pleasure, and then more and more it is not irritating. If anybody is sleepy, let him go to sleep. Apparently, performances that include Lecture on Nothing often use John Cage’s taped voice. I’m sure that’s fine, but I really enjoyed hearing Tim Robbins read it. His actorly skills captured Cage’s wit and much of the vocal cadence without simple mimicry. It was a wonder to behold. Whatever you want to call it – static, nonlinear, meditative, living in the moment – there is a whole range of Western music that doesn’t “go anywhere” but invites you to listen in the moment. This can be art music with Asian influences like that by Cage, Hovhaness, or Harrison; pop music like the long jams on songs by Stevie Wonder and Prince, or Van Morrison meditative songs like “In the Garden”; minimalist music; and whole swaths of jazz and new age music. Cage is a great celebrator and philosopher of this style of music. I very much like music with narrative and direction (I better, since I perform a lot of symphonic and opera music), but I like this music too. I also like being able to listen to anything as music, like the typing of the keys as I write this post, accompanied by the quieter hums and sounds within the house, such as the refrigerator running in the kitchen next to the study. Cage really helped open my ears to that type of listening. My introduction to John Cage was pretty unusual. Our local underground rock station, WABX in Detroit, played some excerpts from Indeterminacy one night, and I had to learn more. I found Silence in a library (at Interlochen? at MIT? I can’t remember) and things were never the same after reading it. 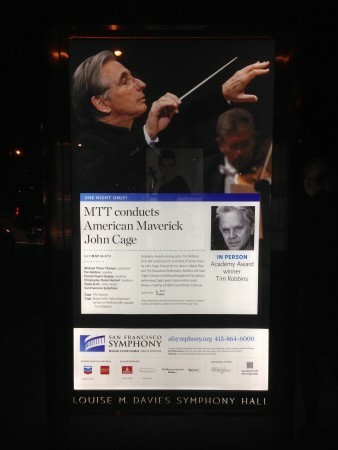 So thank you, thank you, thank you to Michael Tilson Thomas, the San Francisco Symphony, Tim Robbins, and all the other great soloists for a wonderful celebration of John Cage’s work in a most memorable concert. The concert was so good it got me blogging again for the first time in eight months! 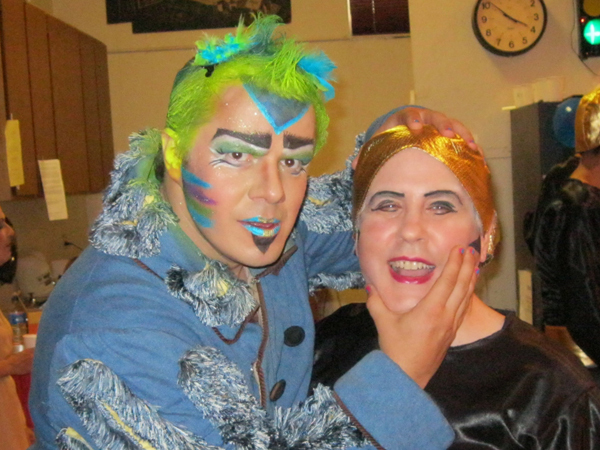 As my summer break from music rehearsals comes to an end, I wanted to be sure to look back at our production of Mozart’s Die Zauberflöte (The Magic Flute) at West Bay Opera. This was my first time singing a fully-staged Mozart opera at West Bay and we had a wonderful cast for it. In the picture you can see Kirk Eichelberger as Sarastro while the men’s chorus sings backup to his aria. This aria came just after I had my line in my speaking role debut at West Bay Opera. Granted, the Third Priest has just two words – “Ist wohltätig?” – but that’s two more words than I’ve had in my previous dozen West Bay Opera productions put together. There weren’t any auditions for this. As you can see, I’m in the front of the triangle of priests, so with this blocking I was the natural choice to speak these words from the chorus. Sometimes being the shortest guy does pay off! The most amazing experience for me was to work again with Eugene Brancoveanu as Papageno, who took over the role when Krassen Karagiozov had to bow out of the production. In his rave review in San Francisco Classical Voice, Jason Victor Serinus described how Eugene’s “every look and movement is energized with intention.” This was so true. As Third Priest, I got to have a couple of entrance bits with him. It was a master class in comedy acting to see how he would add one little thing to another, never forcing a laugh, but having the laughs come from the actions of a fully realized character. 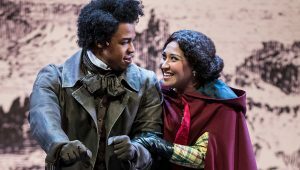 I had performed with Eugene once before in Fremont Opera’s semi-staged Barber of Seville, but this was more up-close-and-personal and so much fun. Here we are recreating one of the entrance bits backstage. Onstage Papageno was blindfolded, flailing his arms in my face while trying to figure out where he was once we stopped walking. Next week I start rehearsals for a real, credited speaking role. I have been cast as Calynx in Lyric Theatre of San Jose‘s upcoming production of Gilbert and Sullivan’s Utopia, Limited. Calynx’s lines are all in one scene at the start of the show, but he does have one of the funniest lines. And there are lots more words than the Third Priest! This will be my first time performing with Lyric Theatre since I played trumpet for one of their prior Utopia productions 35 years ago. Utopia is infrequently done in part because it has a huge cast (16 roles), and because it became unpopular when D’Oyly Carte didn’t revive it after its debut run. That was largely for cost reasons at first, but then the lack of production history fed on itself. I’ve always loved the show: its twin targets of imperialism and capitalism are topics that have always been ripe for satire. 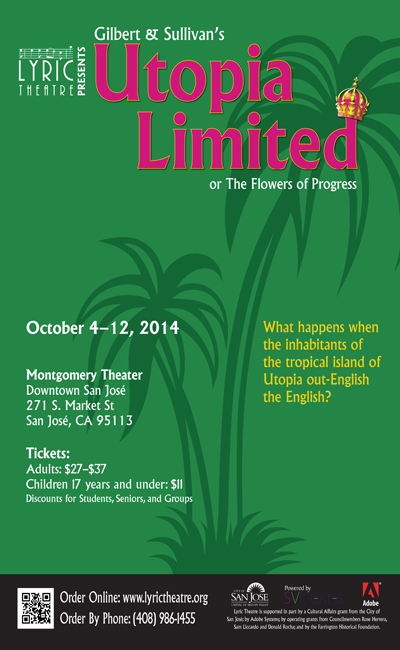 Performances will be October 4, 5, 9, 10, 11, and 12 at the Montgomery Theater in downtown San Jose. Lyric Theatre has done very well by the show over the years, but it still comes around only about once a decade. Don’t miss this chance to see it. Production photo by Otak Jump. Backstage photo by Mark Baushke. Last November, Finale 2014 was introduced with a new file format that is both forward and backward compatible. Finale 2014 will be able to open files created in future versions of Finale. The same technology was used to allow Finale 2014 to save files in the older Finale 2012 format. The new file format has been one of the most popular features of the critically acclaimed Finale 2014 release. One of Finale’s features is its ability to create custom SmartMusic accompaniment files. In Finale 2014, the format for these accompaniment files changed to match the same MakeMusic universal file format used for Finale files. However, SmartMusic had not yet been updated to use these new files, requiring Finale 2014 users to save back to Finale 2012 and create their accompaniment files there. Today, MakeMusic updated the SmartMusic applications for Windows, Mac, and iPad to open SmartMusic accompaniments in both the new file format (.smpx) and the old file format (.smp). Because the new file format is both forward and backward compatible, we will no longer have these incompatibilities between Finale and SmartMusic versions. The current version of SmartMusic will be able to read accompaniments created in future versions of Finale. Just as before, the current version of Finale will be able to create accompaniments for later versions of SmartMusic. This new file format is a key part of the modernization of MakeMusic products that my colleagues and I have been working on over the past two years. It paves the way for further improvements over the coming years. We are delighted to introduce it to our SmartMusic customers as well as our Finale customers.